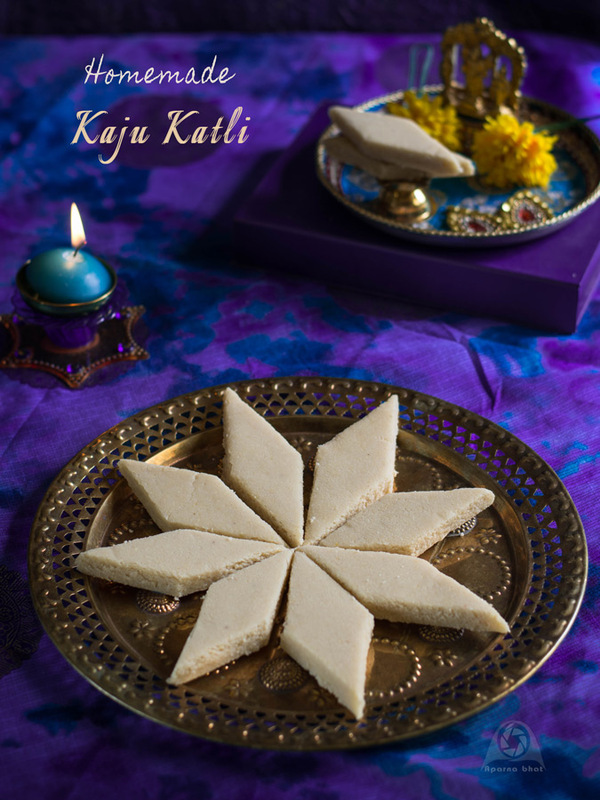 Kaju Katli [Cashew fudge] is known to be a traditional mithai prepared during the festive season especially Diwali. It is loved by one and all. Whenever we enter a mithai shop to buy a pack of sweets for guests, my elder one sees to it that we buy an extra box for taking them home :). I finally dared to attempt and make these katlis once again. When I decided to prepare them for first time I browsed through many recipes and reading each of them I gathered few pointers - it has basic ingredients like cashew powder, sugar, water, little ghee ... aah so easy and simple recipe that I went ahead ... my first attempt ... it was a failure. The misture turned out to be a hard lump and I could not roll it out smoothly. I knew I had gone wrong with the sugar syrup consistency. Getting the correct consistency is the trick in making this sweet, if you fail then the whole task goes for a toss and the mixture is a mess. Failed first attempt but I didn't stop at that,,, did search on sugar syrup consistency. Browsing through different blogs, videos, cookery books which is when I got to know about liquid glucose, an ingredient used to prevent crystallization of sugar. In simple words it prevents hardening of sugar especially after it has reached the stage of one thread consistency. It improves the form and texture as well as prevents discolouration of the finished product. 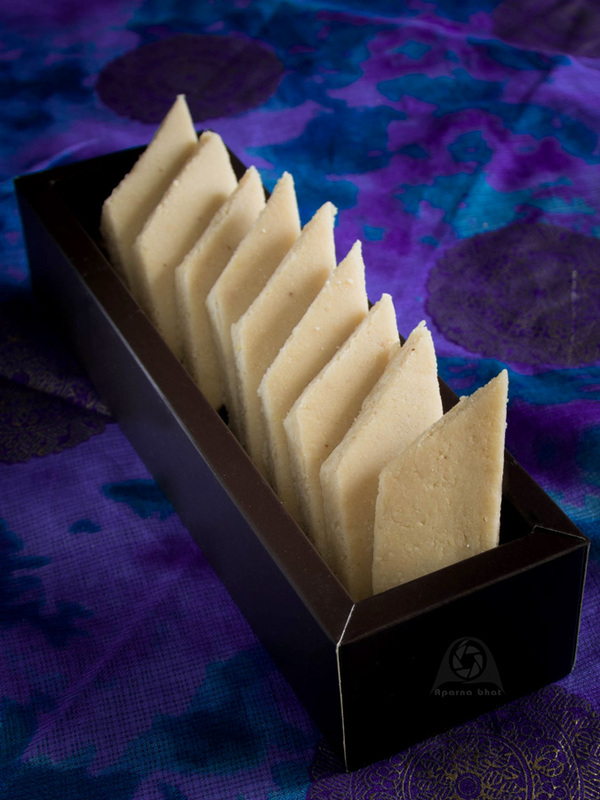 It is known for its use in many recipes like baked goodies, biscuits, jams and jellies and one of them was Kaju Katli by chef Sanjeev Kapoor in his book "Sweet Temptations". Since liquid glucose was available at my place, this time I just decided to go ahead with his recipe. The outcome was quite well compared to my previous attempts and they tasted delicious. My elder one was extremely happy and the sweet is almost getting over at home. Take sugar and water in a pan and cook it on medium heat. Once the sugar dissolves lower the flame and check the syrup stage till it reaches one string consistency. Bubbles will start appearing on the surface of syrup, take care not to stir much after this stage because this causes crystallization. Now remove the pan from the flame, add liquid glucose and ghee. Stir in well. Add cashew powder stirring continuously. Put it back on flame and keep stirring. The mixture will thicken and turn into solid mass. Pinch a small portion to see if u can roll the mixture into smooth ball between your fingers. If so then switch off the flame. Allow it to rest for 5- 10 mins. Grease your hand with little ghee and knead the mixture gently into smooth pliable dough. Roll it on a greased flat surface with greased rolling pin to desired thickness. [You can also place a butter paper over the dough and then roll over it]. Cut it diagonally or any other shapes. Allow it to set at room temperature. Store them in airtight containers and refrigerate them. 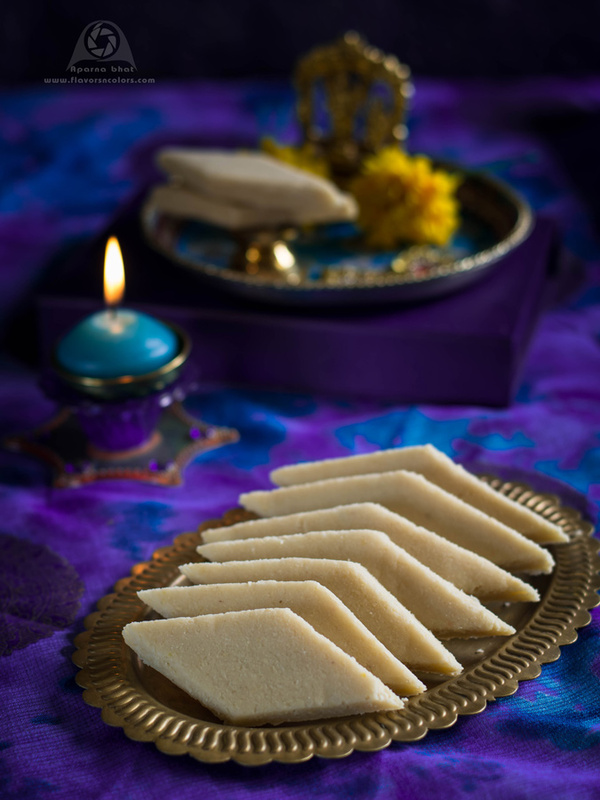 Relish these super melt in mouth burfis and celebrate the festival of lights with your family and friends. If cashews are refrigerated bring them to room temperature before grinding. Keep in mind not to overdo while grinding the cashews, otherwise oil will ooze out from it. While kneading the dough if you feel it dry add a tsp of milk, and if its very sticky u can add tsp of milk powder. Sending this as an entry to Diwali Bash and Diwali special event. really well made. looks so festive and yummy.